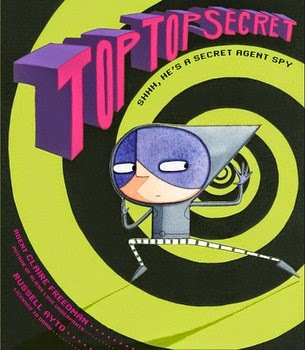 Sid is a secret agent spy, and Top Top Secret is the story of how he recovers a stolen ring. Top Top Secret is told in rhyme, and the book design is really important. In many places the words are printed to demonstrate what’s happening (as Sid goes “up steep steps” the words are found in that very spot, on an angle leading up the steps). In search of the stolen ring, which belongs to the King, Sid makes his way through a drain and long, muddy shaft, then a river infested by dangerous animals. Watch out for self-destructing letters and trapdoors, too. As any good spy should, Sid has super-dooper spy gadgets. There’s goopy goo which lets him walk up walls, and go-fast telescopic skis to zoom through water at speed. This is one cool spy. He’s central to a precisely-told story, packaged with sleek illustrations, and lots to see on each page. Fabulous and fun. So, just who did steal the ring? That’s Top Top Secret!